While I absolutely love the highs and lows of the NCAA basketball championship, I prefer our family life to be a little less dramatic. Unfortunately, my preferences matter little in the grand scheme of things, and this past month was full of drama, joy, sorrow, suffering, and every other emotion in between. In the past, I have mentioned that March has always been a difficult month for our family, and this year was no different. It all began with severe morning sickness--yes that's right, we are expecting another little one in October! The all-day nausea was far more severe than my previous pregnancies. Couple this with a pregnancy-related, very itchy rash covering my entire body, and I was pretty miserable. Eating very little, I soon experienced some fainting episodes, followed by some severe back pain. Other pregnancy complications led to an u/s, which showed a beautiful heartbeat--praise God!--and a very large cyst. I was put on bedrest until the 12 week mark for fear that the cyst could rupture and disturb the pregnancy. I have now passed that mark, and the nausea has improved a bit. In addition to the crazy thought of a mother of 3 young children on bedrest, last week our entire family came down with a stomach bug. The baby ran a high fever, had a seizure, and I removed myself from bed-rest to take him to the ER. We were released in the middle of the night. After about 5 hours of sleep, I awoke to stomach pains. 24 hours later, I was severely dehydrated and heading to the ER. After 4 bags of fluid and some anti-nausea medication, I was feeling much better. I returned home to another vomiting child, and Mr. Red with stomach pains. It was quite a week! Back in February, I was feeling pretty miserable and wondered how I would make it through the 1st trimester of this pregnancy. MaryAlice suggested that I just need to survive until St. Patty's day. And while she was off by about 1-week (I was in the hospital on St. Patty's day), we have turned the corner and things are better. The weather is improving by the day, Easter will be here in only 2 shorts weeks, and this past Monday I heard the baby's heartbeat! March is almost over and April brings great hope. I am praying for an easier 2nd -trimester, less anxiety about the health of this baby, and improved overall health for our family. This is my 6th pregnancy, and I only have 3 healthy children, so I worry excessively while pregnant. Now that I'm able to eat, worries about the health of the baby are at the forefront of my concerns. I would greatly appreciate your prayers! We love it! I opted for this instead of the wooden holder MaryAlice suggested because it can hold many different types of writing implements, and takes up very little space. We have had constant problems organizing our art/school supplies and this has completely solved the problem. The kids know exactly where all their supplies go, and they put them away when finished. I purchased this at The Lakeshore Learning Store, and it was a little pricey--$30--but totally worth it! I'm actually thinking of purchasing another more shallow holder for our crayons. So it has been brought to my attention that the links are not working. The Link for Lakeshore Learning Store does work, so click on that, then type "marker holder" in the search box. To find the crayon holder, type "crayon holder" in the search box. I hope this helps! I have removed the two links so that there isn't any more confusion. Do Your Kids Want To Write a Book? Some dear Princetonian friends are contemplating starting an on-line business "centered around having kids write and illustrate their own books on-line." I think everyone on the blog is a self-proclaimed bibliophile. So, while none of us would ever put away our paper and colored pencils, it is an interesting idea. They have set up a survey on-line to gauge interest and gather input. It can be found here. If you have any thoughts or ideas, please click through and check it out (there is a gift card raffle for filling it out)! Weaning a toddler...And getting her to drink milk! 1) Weaning a 17-month old: My son was only 14 months when I weaned him, and it took about a week but the transition wasn't terribly difficult. I'm anticipating a bigger struggle this time around. 2) Helping to ease Maria into drinking cow's milk. Someone had suggested goat's milk to me - any thoughts on that? My son loved vanilla rice milk so that's how we eased him into drinking regular cow's milk, but Maria isn't interested. Thanks in advance for any helpful tips! God bless all of you this weekend! ...you arrive for an appointment and sit down to wait, only to look down and notice that your blouse is halfway open and the baby nursed over two hours ago! The image is of Our Lady of Guadalupe, and I have this frame and the vase of flowers sitting above my kitchen sink at all times to remind me to be humble and gracious in my daily life. The idea for the candle with the image of the baby Jesus inside came from here, and the cake is just a simple yellow cake with "Yes!" written on top, to remind us of Mary's "yes" to God. Recently it was confirmed that President Obama has accepted an invitation to speak at Notre Dame's commencement ceremony this spring. Understandably, this has elicited a stream of criticism of the University President's decision to invite a public figure whose views and policy positions stand in direct opposition to some of the core tenants of the Catholic faith. He has responded to the criticism by claiming that President Obama's visit to the school could be one of the first steps in his conversion of heart. Yet, there is nothing on the itinerary like a debate or round table discussion on life and death issues. Instead, the President will have a national soapbox from which to speak at one of the, supposed, pinnacles of Catholic Education. Then the school will further confuse American Catholics by awarding President Obama an honorary degree, then he will leave on Air Force One. I don't know about you, but this seriously bothers me. I am in deep agreement with the Bishop of South Bend, who has been quoted as saying that Notre Dame University must seriously consider whether it is choosing prestige over truth in their decision to honor President Obama in such a way. Life Site News provides greater detail on this developing story, as well as information about how you can make your opinion known on this matter here. I know we have a Builder Husband who is a Notre Dame grad, what it is the buzz on the inside, B-Mama? In these difficult economic times, adding another child to your family can seem overwhelming. And apparently, the economic recession is increasing the number of abortions and sterilizations. Planned Parenthood of Illinois performed a record number of abortions in January, and clinics in the St. Louis area reported a 7% increase in the number of abortions. According to this associated press piece, the number of married women and women who already have children seeking abortions are on the rise. "This was a desired pregnancy — she'd been getting prenatal care — but they re-evaluated expenses and decided not to continue," said Dr. Pratima Gupta. "When I was doing the options counseling, she interrupted me halfway through, crying, and said, `Dr. Gupta, I just walked here for an hour. I'm sure of my decision.'" ..Dr. J. Stephen Jones, a urologist at the Cleveland Clinic, said he has seen a surge of men seeking vasectomies, with his monthly caseload rising from about 45 to more than 70 since November. He said most of the men were married, had kids, decided they couldn't afford more and opted to get a vasectomy while they still had job-related health insurance. "Several articulated very forcefully that the economy was the motive," Jones said. ...Dr. Anne Davis of New York City, medical director of Physicians for Reproductive Choice and Health, said one of her married patients recently became pregnant with what would have been her third child. Because the husband was self-employed, the couple could afford only a low-cost family health policy without maternity benefits, Davis said. They estimated the birth would cost at least $30,000 and reluctantly opted for abortion. What strikes me most about this article is that there is no mention of "other choices" available when finances are tight and a baby seems like an overwhelming financial responsibility. Abortion is presented as a sad, but absolutely necessary choice for couples in very difficult financial straights. The article even mentions the serious doubts of one married woman who chooses not to get an abortion after seeing a sonogram at the clinic. I'm sure the widespread societal acceptance and financial assistance available for abortion services helps perpetuate these attitudes. And this brings to mind a couple at my parish who recently adopted two children from Poland. Poland, a nation with strong Catholic roots, has very strict abortion regulations, making it very difficult to have an abortion. This couple from my Parish adopted their first child from Poland and were told he was the youngest of 7 children, and his parents lived in such dire poverty that they just couldn't afford to raise him. His birth parents loved him and wanted him to have a better life, so they placed their son in a loving home, with wonderful parents, parents who had been waiting a long time to raise a child. Shortly after their arrival home, the adoption agency informed them that the birth parents were expecting another baby, and they were asked if they would be willing to raise the new baby as well. They were overjoyed, and returned to Poland a year later to adopt their son's baby sister. I'm sure the Polish birth parents of these children suffered terribly in their very hard decision to allow someone else to raise their children. They knew the joys and struggles of parenthood, and they knew their current circumstances were not conducive to raising another child. But instead of choosing to end the life of their children, they gave them life--and a life of love. It wasn't a natural choice, as in the right order of things no parent would have to part from their child because of financial difficulties, but it was a choice made in love. The adoptive parents informed me that their adoption story wasn't that unique. This happens often in Poland. I have to believe the strict abortion laws in Poland were partly responsible for the very life of their two beautiful children. Not surprisingly, Planned Parenthood is using the current economic crisis, and the stories of the couples in the article, to increase their funding base. If there is an upside to the current sobering trends, say family-planning advocates, it may be that federal and state policymakers will boost public funding of contraception. "We're seeing a receptivity among our legislators to hear about prevention policies," said Lori Lamerand, CEO of Planned Parenthood of Mid and South Michigan. "Folks who wouldn't have opened the doors to a Planned Parenthood representative are now willing to talk to us." And so now, more than ever, it is important to support pro-life and specifically adoption ministries. Let us not forget that even in these difficult economic times, there are plenty of couples out there praying and waiting for a baby. And if a woman finds herself in a dire financial situation, I hope and pray she will put her baby into the loving arms of a couple like this, rather than into the knife of an abortion doctor. I teach CCD to 3 year-olds at our church, and one of the best parts of teaching has been the music class that occupies the first 20 minutes of class each week. Our music teacher has an amazing gift with the children, and the songs that she teaches - complete with hand movements to keep everyone engaged - are full of wonderful, substantive messages for the little ones to soak up. Each week the kids sing songs like "My body is a temple of the Holy Spirit," "Mary loves me this I know, because Jesus told me so," and "You're a great big God, a very busy God, but you take time for me." The children sing with such enthusiasm and vigor, it's really heart-warming to watch! "Oh be careful little eyes what you see, oh be careful little eyes what you see; For the Father up above is looking down in love, Oh be careful little eyes what you see. Oh be careful little heart whom you trust..."
"It's a slow fade, when you give yourself away; It's a slow fade, when black and white have turned to gray; Thoughts invade, Choices are made, A price will be paid, when you give yourself away; People never crumble in a day...It's a slow fade..."
Today, let us all remember that "it's the second glance that ties our hands," that we all have many choices throughout the day between what we know to be good and true and what we know is evil, and that our children are watching more closely than we might imagine. Let us be mindful of what we hear, say, think, and do, realizing that it is all of consequence and that we are either moving towards God or away from Him every day. And when we make mistakes, let us run as quickly as possible to the feet of Jesus, to ask for the mercy and forgiveness that He has promised us. Let us encourage each other to make frequent use of the Sacrament of Reconciliation, in which Jesus forgives us our sins and bestows on us the grace to live pure and holy lives. --You can tie your own shoes. --You get your first pair of roller skates. --You ask for a birthday trip to the hair salon with your mom. --You are emphatic that your cake must be pink and be decorated with flowers. You explain that this requirement can be satisfied with either pink icing and white flowers or white icing with pink flowers. But it must be pink, and it must have flowers. --You can play board games. --When you need to vomit, you make it to the toilet in time (we learned this during a recent stomach bug). --When other people in your family are also vomiting, you understand that your birthday party needs to be moved to the following weekend. --When you are done vomiting, you realize there are certain foods you cannot eat for a while. -- You can read, sort of (but not when vomiting). --You are a real kid! We cracked up seeing these shirts on your boys, and we're cracking ourselves up wearing them as we kiss "Thing" season goodbye and welcome the spring! So much happened this week, and I thought so many times of posting, but I was just so busy living! Monday: Okay, how sad is it that I can't remember that far back? Tuesday: We read Jamie O'Rourke and the Big Potato, and ate green cupcakes for St. Patrick's Day. I told my kids the very funny story of when Jim Ryan saved a leprechaun from drowning in a puddle. Inspired by KateE's library storytimes, I am trying my hand at more storytelling. I was disappointed that I couldn't do more for this feast, but then I saw this post, and it gave me hope -- next year, Holly's in charge! Wednesday: PT took lots of bike rides. He has bought a new bike for himself. He got a good one, he has been saving for a while and he still had to borrow part of the money from us. He and his father drafted papers, and there have been a lot of timely conversations about real life finances. Thursday: We made homemade rolls for St. Joseph's Day dinner and had spaghetti and meatballs. Thanks to my mom, I had a bread maker to knead the dough and a freezer full of meatballs, and thanks to my MIL dinner appeared on the table while I was out for a run! I am so blessed with helping hands. Tonight MaryB told me that she did like her name. I told her that she is named in honor of the Mother of God, and also named after the most beautiful woman I have ever known. She asked me if this woman wore beautiful party dresses -- boy, did she! I can't wait to get some pictures to show her. Now, she loves her name again. Names are important, and girls deserve to have a sense of family history as much as boys do. Friday: Kids are sick. Just as TexasMommy likes late night feedings, I don't mind sick kids. They are cozy, want to hear stories, do some quiet school work, play trains in bed, and then, they fall asleep and I can get stuff done. Plus, time seems to stop -- activities get cancelled, dishes stay on the counter, laundry piles up, but I just let things go for a while and be a nurse mother. Lots of one on one time with each child as I go from bed to bed reading stories. Of course, this is only fun for about a day, so hopefully it is the 24 hour variety. In the afternoon, a little bit of PBS kids time and I can get the house put back in order. Baby James is being baptised this weekend, and we are making a retreat to prepare for PT's first communion, so we have busy and happy times ahead! Happy days are here again! Making it through the winter as a mom with little children at home is a massive accomplishment, one of the biggest accomplishments in a year, if you ask me. This week has been the first where the weather is clearly and once-and-for-all turning to spring here in the mid-atlantic/northeast. What delight. A good and bad thing about being a mom at home is how keenly we must live according to the changing seasons. What a blessing to relive the wonder of our own childhoods as we open the doors and windows and set our winter-caged children free into mud puddles and budding flowers in the spring; as we spend long afternoons and warm evenings splashing and picnicking outside in the summer; as we crunch through piles of fall leaves and teach our children to appreciate their changing colors; and as we rot inside in the winter counting down the weeks to spring... and savoring the slow-paced days with our children in spite of the cold. Winter has its upsides, but I still have a long way to go before I can say I enjoy it. As far as I can tell, the best thing about winter with kids is it makes me love, not just appreciate but LOVE, the other three seasons. Before children, the winter passed quickly and busily, without too much notice. In college we scrambled toward end-of-semester deadlines, interrupted only by extracurricular activities and occasional snow wars, so the end of February came quickly. My stay-home-mom friends who previously held full-time careers say that winter was the busiest time of the year, with taxes coming due, or property sales peaking, or other year-end/year-beginning deadlines pressing. Spring conveys the spiritual mystery that my kids and I are just beginning to sense now—a renewal in the physical world that we can smell, see, taste, hear and touch. A foreshadowing of Easter, with the whole world in full bloom when we finally do celebrate Christ’s Resurrection. What a blessing it is to be forced—by the circumstance of being a stay-home mom to young children—to watch the spring slowly unfold. And what a joy to bid farewell to the winter again! Hooray, we've made it!! And on a side note, is there anything in the world cuter than a baby discovering nature for the first time? Our routine last summer and fall was having Angelina nap in the sling while the other two kids played outside. Not so this spring! Docile 11 month old Angelina throws the most explosive baby tantrum if she's not released from the sling or the stroller immediately upon arriving at the park. Once freed, she plunges her hands and arms into mud and smears it on her face; she works her hands through the sand over and over and over again to see how it falls; she digs her fingernails into the roots of grass patches to pull them up; she crushes berries and flowers to watch their colors smear. She breathes heavily and steadily and focuses intently as she discovers this whole new world. I can't get enough of watching her. And I think we're going to need some new playclothes. Happy Feast of St. Joseph! Following are a beautiful reflection given by Pope Benedict, as well as a recipe for soft pretzels, a traditional Lenten recipe and a food sometimes associated with St. Joseph's feast day. Food for the soul and for the body - enjoy! The silence of Saint Joseph is given a special emphasis. His silence is steeped in contemplation of the mystery of God in an attitude of total availability to divine desires. It is a silence thanks to which Joseph, in unison with Mary, watches over the Word of God, known through the Sacred Scriptures, continuously comparing it with the events of the life of Jesus; a silence woven of constant prayer, a prayer of blessing of the Lord, of the adoration of His holy will and of unreserved entrustment to his providence. It is no exaggeration to think that it was precisely from his "father" Joseph that Jesus learned -- at the human level -- that steadfast interiority which is a presupposition of authentic justice.... Let us allow ourselves to be "filled" with Saint Joseph's silence! In a world that is often too noisy, that encourages neither recollection nor listening to God's voice. Stir in 1 1/4 cups sifted all purpose flour and knead until the dough loses its stickiness. Let the dough rise in a covered greased bowl until it is doubled in bulk (this is called "proofing" the dough). Punch down and divide it into 12 pieces. Roll each piece into a long rope and form it into a pretzel shape. Place the pretzels on a greased baking sheet and let them rise until almost doubled in bulk. Preheat oven to 475°F. Twice in the last week people asked me if Incredibaby was sleeping through the night. I laughed casually and said, "Oh, no," as if it was silly to think that I could possibly have a full night of sleep. Then I laughed out loud at myself. After our first child was born, I wallowed in self-pity as to the extent of my sleep deprivation. I would call one of the other builders, who would commiserate with me about the gravity of the situation. Now, I sincerely enjoy the quietness of nighttime feedings. I enjoy rocking my sweet baby in the dark surrounded by silence. I think it is the quietness that I am enjoying more. I love silence. But with three little boys, silence is in short supply. And if it is momentarily silent, it is usually a bad sign. Someone is going to be in trouble for something, which will lead to not silence once again. At night it is silent. I can pray or think or not think. And I can be silent and I can listen to silence. I can feel my baby's head grow heavier as he drifts back off to sleep. I can rock him uninterrupted by the urgent needs of two other toddlers. I am no longer desperate for these days to be over...for my baby to sleep through the night. I relish this time we have together. Now, when asked how I'm sleeping, I think I'll say that, thanks be to God, I am sleeping like a baby - my baby. "By virtue of our Apostolic office, we warn and admonish in the Lord all Christians of whatever conditions they may be, and enjoin upon them that for the future, no one shall venture unjustly to oppress the Indians, Negroes or other men whoever they may be, to strip them of their property, or reduce them into servitude, or give aid or support to those who commit such excesses or carry on that infamous traffic by which the blacks, as if they were not men, but mere impure animals reduced like them into servitude, contrary to the laws of justice and humanity, are bought, sold and devoted to endure the hardest labor. Wherefore, by virtue of our Apostolic authority, we condemn all these things as absolutely unworthy of the Christian name." The Holy See's admonitions were ignored in the United States, where white Catholics were pretty much in line with other white Americans regarding the "peculiar institution" of slavery. Some were pro-slavery without apology; some were "pro choice" - personally opposed to slavery, but unwilling to impose their morality on others; some were opposed to slavery in theory even as they owned slaves, being unwilling to impose their morality on themselves. No doubt many Americans saw the Church as out of touch, in need of updating its moral teachings. So there was no national conversion on slavery; it took a war to redeem the nation's sin in blood, to use Lincoln's imagery, and a constitutional amendment to end it. Yet now we look back and ask, "What were they thinking? How could they have done it?" The injustice of slavery, which was so entrenched, so convenient, and so profitable for so many, seems obvious to us, as we inaugurate a person of color as our new President. But we also remember the court decision that has made abortion an entrenched, convenient, and profitable institution for so many today, and which has cost our country 48,000,000 lives in the space of a generation. Our (surviving) descendants will ask, "What were they thinking? How could they have done it?" Some of us have always been pro-life; some of us have become pro-life after having had other views; some of us have become pro-life after having had, or paid for, or performed, abortions; and God bless us all. But our "peculiar institution" still thrives, and this time war is not an option. Only conversion and repentance can redeem a nation in which the value of a baby's life is still an open question. What will it take to soften our hearts? Every year, today's Old Testament reading hits so close to home. Naaman, seeking to be cured of leprosy, is told by the prophet Elisha to wash 7 times in the Jordan river. Naaman is disappointed that Elisha didn't perform some miracle right there and went away. His servants said, "if the prophet had told you to do something extraordinary, would you not have done it?" I went to Princeton wanting to be a mover and shaker. In classes, we tackled problems such as moving entire countries to democracy and shaking up the bioethics world, so that babies would no longer be killed. At the moment I am moving large piles of laundry from the washer to the dryer and shaking sand out of shoes. And I sometimes complain internally about the fact that I am not doing "incredible things." And that stubborn pride starts to creep in, once again. I want to do something extraordinary. And then, convicted of my pride, I remember that the ordinary is extraordinary when offered to God and done with love. Lent is a beautiful time to remember this once again. I should print out this Old Testament passage so I read it everyday (note to self: print this out and read it everyday). God is in the ordinary, which in turn makes everything extraordinary. Virgin most humble, pray for us! is that you can wear your brand new bathing suit to school when it is 40 degrees outside! My family and I have been living in central Germany for six months now. As such, my thoughts have tended toward cultural comparisons quite frequently in recent days. Maybe our first half of a year here still characterizes us as neophytes, but I just can't help but share some tidbits of micro-sociology that my husband and I toss around over dinner. Recently we were out to eat in a downtown tapas bar -- a rare date without children. We had not arrived at the restarant until 2030 because we had wanted to get the baby to sleep ourselves before leaving. This, unwittingly, put as right in the middle of Euro-nightlife. People were just being seated all around us, the music was pumping, the alcohol flowing and the plates of food enticing. I looked around and commented to my spouse that many of these people had to be in their 30s and 40s - where were their kids? This question triggered a discussion of several possible explanations, some more cynical than others: 1)Germans have fewer children than us, perhaps these couples had grown children or even had not begun their families yet/ were never going to have children 2) Germans are not as transitory as Americans and probably live closer to grandparents who could watch the children while the young parents went out to dine or 3) Maybe the babies were safely strapped in their cribs in some urban apartment nearby. I am not being flippant here -- both my parents (who lived in Germany in the mid 80s) and my 30-something German mommyfriend have explained to me how it is common practice to put your child to bed, strap them in the crib (many cribs here come with the straps attached), lock the apartment door and head out for dinner downtown. An American parent's skin might crawl at the suggestion, but their crime and kidnapping rates are not what ours are either. So, anyhow, back to the tapas bar... in comes a group of four likely-homosexual men with their dogs. "Germans love their dogs," I comment to Husband. Germans love animals, good beer, and spiced wine. Espresso reigns over drip coffee, the restaurants are plentiful, the food expensive but very high quality. Cars are small and fuel-efficient. People smoke socially and converse long after meals. Oh no... I was once again slipping into my dangerous Euro-temptation state. These lifestyle choices are all very self-fulfilling and materially/physically pleasing. Our van cost more and is more expensive to fuel than their mini Coopers, but it is irrelevant because my family will soon outnumber the seats of a mini. I would love to return to the days of heavy espresso and red wine drinking, but breast-feeding and the ever-present possibility of pregnancy do not allow this. Dogs provide all the affection and very few of the demands of a diapered infant or talkative preschooler. Hold on! What was I thinking? Level-headed Husband had to right my mental ship. Most modern Germans are good at hedonism. Their lifestyles are crafted in such a way as to demand very little self sacrifice and being the flawed human that I am, this life of pleasure can be appealing in a weak moment. My husband lovingly reminded me that, while it is ok to be tempted, we are called to something greater. 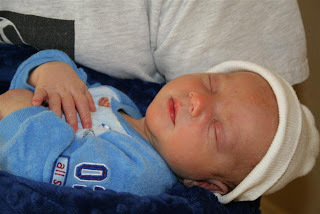 Made in God's image, we are toiling to create and raise little souls to know and love Him -- only this is true happiness. The espresso and tapas will have to wait, I've got some bunk-beds and kid-size instruments to buy! *Buy paper place mats from a party store and head to Kinko's to copy a coloring page or add an expression "You Are Special Today" to them. Kids can color and decorate and offer to a family member to use at dinner. *Many families own a Red Plate (and if you don't, you should get one!) 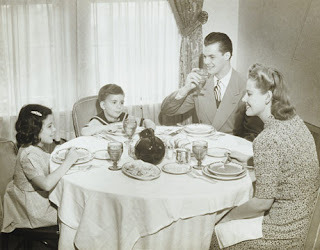 --have the children decide who should be awarded the red plate for dinner on any random day. Have a special presentation. *Encourage the children to set the table, but in their own way. Have them come up with an interesting centerpiece of their own creation. Perhaps provide a plastic votive for them to fill with whatever they choose. Make their presentation a surprise for the family to see when they sit down to eat. *Buy world map place mats and "travel with your taste buds" to whatever country is represented by the meal. Use black electric tape to map out a line from home to the location. Learn about its culture. Calculate the distance there. Have the family dress up in ethnic garb to celebrate the meal. *Have single color meals and invite family members to show up to dinner wearing the desired color. Use food coloring or natural dyes (like blending flatleaf parsley and milk to create a green "dye" to use in food prep). Coordinate it with literature like Green Eggs and Ham and Stone Soup. *Use Tostito Scoops to serve kid-size portions of whatever the family is eating that night for dinner. Buy wonton wraps and have kids fashion them around mini silicone muffin molds. Fill them with an Asian-inspired recipe or whatever! 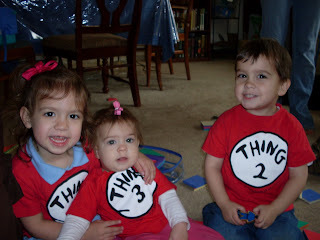 *Have special aprons/costumes for the kids to wear while cooking. *Use special (easy) touches like a "food stencil" to use with powdered sugar to make shapes on top of a cake. "Don't reinvent the wheel, just make the wheel look amazing." Bon appetit and many blessings! 10. Only for today, I will have no fears. In particular, I will not be afraid to enjoy what is beautiful and to believe in goodness. Indeed, for twelve hours I can certainly do what might cause me consternation were I to believe I had to do it all my life. "You shouldn't talk to strangers"
"Yeah, because they might be batman." What do you do to help turn a rough day around? A trip to the park? A mid-afternoon coffee (for mom)? We'd love to hear! Are you too busy to read this post? The reality is that many organizations depend entirely on moms to volunteer their time and energy to make them run smoothly, and these organizations do wonderful things that benefit lots of different people. But sometimes - not always, but sometimes - I think that we, as moms, bite off more than we (or our families) can chew. We think that because we are not working outside the home, we are obligated to take on all sorts of different volunteer positions; in other words, when we see a need, we want to help! Again, I firmly believe that volunteer work is wonderful and so many people benefit from the hard work that moms do, but sometimes the family suffers as a result. Another unintended consequence is that when we spread ourselves too thin, nothing gets done well. Because we are not paid for the work that we do, we sometimes end up doing a sloppy job on one task so that we can move on to the next...And the next...And the next! My proposal: During this Lent, let's all take some time to step back and take stock of what we (as moms) are involved in, why we are involved, and how our involvement affects our family life. Maybe a conversation with our spouse would be helpful in this process. We may discover that we need to ask for help from our friends, we may find that we need to step back from a certain volunteer organization for a period of time, or we may find that all is well! We may even discern that we could take on another volunteer responsibility, if God is calling us to do so. Either way, it can't hurt to prayerfully consider how we spend our time and how this affects ourselves and our families. May God bless all of you and your families on this Monday morning! Saint Frances of Rome, pray for us! Help us to discern what is God's desire for our lives and what is our will. Upon returning home from a 2 hour nature walk with Daddy, Dash (3.5) ran inside and, utterly unable to contain his enthusiasm, exclaimed, "Mommy, Mommy!! I caught a frog and peed on a tree!" 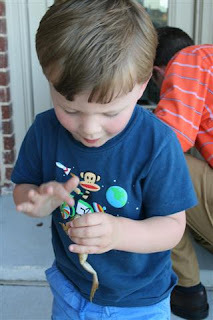 How can you not love little boys, especially the potty-training and amphibian-loving kind! I wish I kept a journal of the memorable mispronunciations in the 18 month-4 year period... I am finding that Bella, almost 4, has mostly outgrown this. Bean, fortunately, has not! 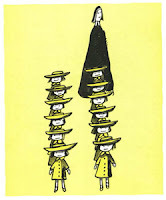 His favorite character these days is Miss Cruella Clavel, the lady who both wants the 101 Dalmations' "furry coats" and watches over twelve little girls in two straight lines, the smallest of whom is "Madelion". I'm sure only a story-loving two year old could conflate the names of Miss Clavel, a French nun running an orphanage for little girls, and Cruella de Vil, "that devil woman" who dog-naps the dalmation mother's newborn puppies to skin them. Any other good ones to share? Growing up, I had little awareness of the guardian angels. I first heard a talk on the reality of guardian angels in college. Soon after hearing this talk, I hit the road with the Princeton Ski Team to go to a regional competition in West Virginia in the middle of a snow storm. As my friend's car slid around on the narrow, winding roads through the mountains in the middle of the night, I uttered my first plea to my guardian angel. Within seconds a large orange snowplow/salt truck pulled out right in front of us and we were forced to slow down to a crawl, being unable to pass, driving on a freshly plowed and salted road. The image flashed into my head of a renaissance angel behind the wheel of an oversized snow plow. After that, I knew I would be speaking with my guardian angel more often. The Catechism assures us of the existence of guardian angels, "From its beginning until death, human life is surrounded by their watchful care and intercession. Beside each believer stands an angel as protector and shepherd leading him to life." What a wonderful blessing! An angel of our very own! Yesterday's meditation in In Conversation with God states, "We have to treat our guardian angel as we would a good friend. He is always on the watch, constantly prepared to give us aid, if only we would ask him." So ask him, we must. Since having children (especially boys! ), my devotion to our guardian angels has increased. We begin each morning asking our guardian angel to watch over us. And I make many more pleas throughout the day. They can help us avoid temptations and to focus during prayer. And they can help us in very physical things, like (today) finding a parking place when I had to run into the pharmacy with a sick child. If we are in the car and the kids are getting fussy I ask for the help of their angels and a big cement truck or a school bus usually come rolling by just in time to remind me of God's presence and that he is watching over us in the little trails of ordinary life. For some people, it is a flower or a butterfly that can remind them of God's hand in the details of ordinary life. For me, it's a truck with my guardian angel at the wheel. Anyone Else Need a Boost? Click here to see one of my favorite musical groups, Celtic Woman, and their amazing version of "You Raise Me Up". I promise, you won't be disappointed! Are you familiar with Grace Before Meals? Founded by Fr. Leo Patalinghug in 2003, Grace Before Meals is centered on one fundamental concept--creating and sharing a meal can strengthen families and relationships. The movement produced a book, a blog, a regular podcast, and even a pilot TV show endorsed by PBS. The show is still in the production phase, but it looks like it will be a wonderful family friendly show, with great recipes! I only had to watch him once to think Fr. Leo was awesome. For those looking for another meatless option during lent, check out Fr. Leo's recipe for eggplant companata. Happy viewing! Who knows what "feminism" really is? We vilify the movement as the impetus for birth control and abortion, yet we benefit from the doors its pioneers busted down for us. We have fabulous college degrees and didn't even have to consider gender when choosing our professions. So, today I would like to thank feminism for what I see as a "professionalizing of the home front." I am a better, more capable, more fulfilled mother and wife then I ever could have been in the pre-feminism days. I am getting better at what I do in our home because I have learned that it is seriously important work. The feminists who went before me and women like my mother who served 24 years as a Naval officer gave me all the options of which I could ever dream. And I have chosen this -- to be a homemaker. A domestic engineer. An apron-wearing, crayon-using mommy. I wield my hunger for books and my Excel spreadsheets in the home: reading about faith and recipes and homeschooling and organizing my chores into manageable chunks on a pretty colored spreadsheet. I can maintain our home and our spirits in only this way. This "women's work" is important and deserves the same professional management as I gave my work outside the home as an Army intelligence officer. Nonetheless, I suspect that if I had been placed in this same role sixty years ago my struggle would have been much greater. Without the current professional options available to women today, I think I would fall prey to the temptation of self-pity and a feeling of being trapped. Maybe it sounds strange to say that I am grateful for the options of which I am choosing not to take advantage, or maybe you understand exactly what I mean. Whatever the case, I just can't help but smile when I think of Gloria Steinham watching me now. What a blessing to be living in the age in which we were placed, truly!